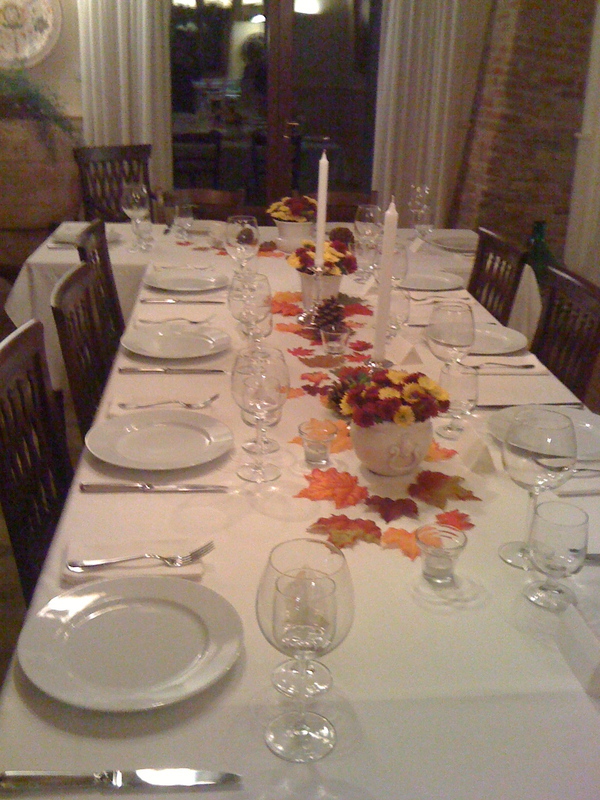 Thanksgiving came to Montepulciano last night. I know you guys in the states have to wait another couple of weeks, but maybe this will whet your appetite. 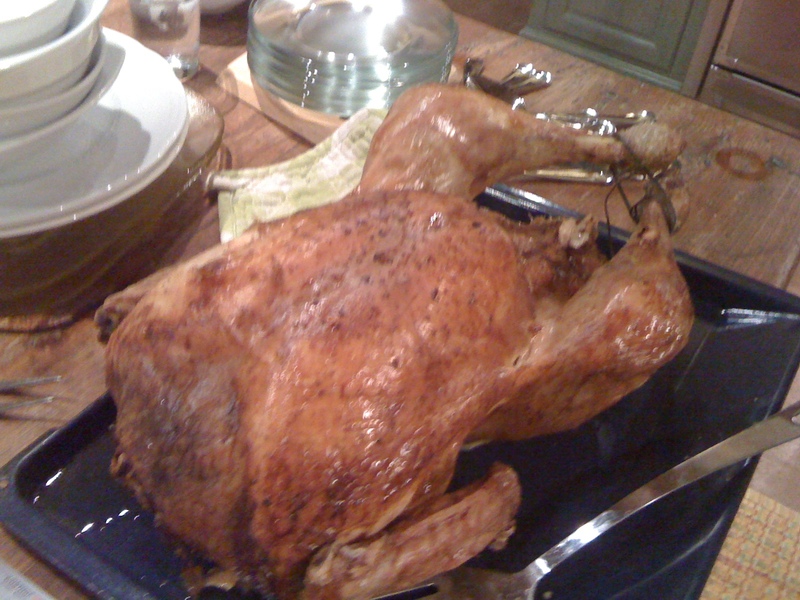 A few years back my friend Terry started the traditional of hosting an expat Thanksgiving to give us a taste of home and each year it has grown in size and fabulousness! Terry and her husband Vince are here about 5 months of the year and leave mid November to get back to their family in the states. The fact that Terry is up for doing a turkey day two times is pretty extraordinary. So among the many many things I am thankful for this year, I am thankful for my friend Terry. Temperatures are starting to dip and the grape vines are showing off their autumn colors, signaling that my work has finished for the season. I will pop in for a few days this week to cover Fabio’s vacation and then I won’t see Poliziano again until spring. It’s time to rest, recharge, write, learn about wine and above all, try to stay warm! The first days of my new found freedom were spent picking olives with my friends Charles and Peter and preparing dishes for our Thanksgiving feast. 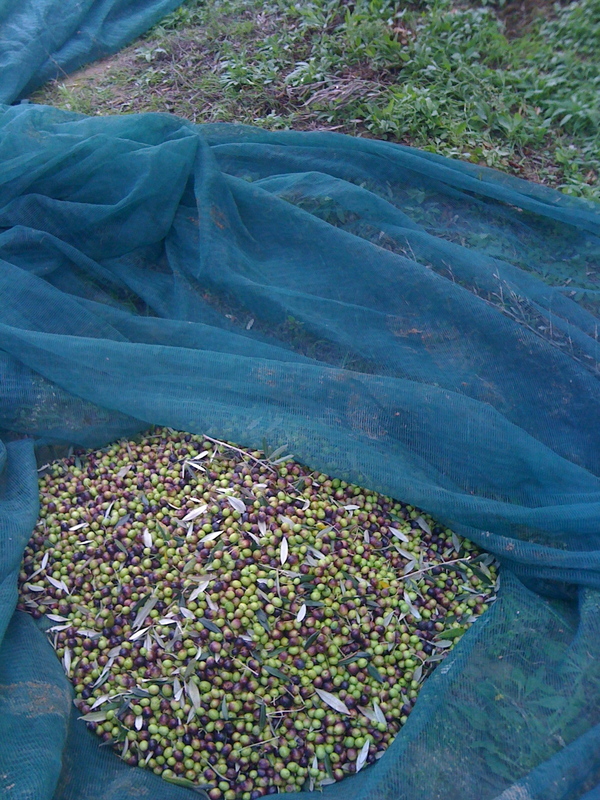 I love the new verdant, spicy olive oil which is now in abundance and is a staple in most of my usual dishes. It is my favorite food group! And I have to say I never quite realized how much my butter consumption has decreased while living here until I started pulling recipes for Thanksgiving. 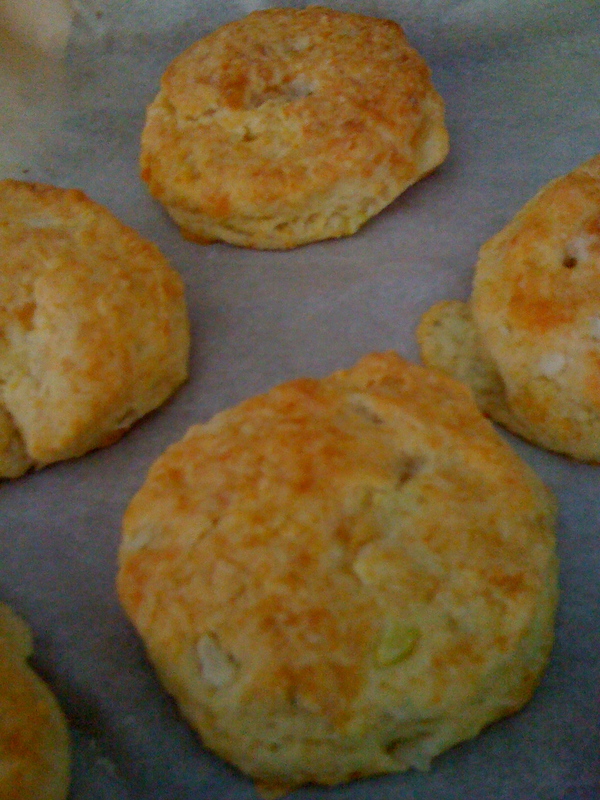 Biscuits, crackers, pies, stuffing… everything wanted lots and lots of butter. In fact, when I went to the supermarket and plunked four blocks of butter into my cart, in that moment I definitely felt the difference in our culinary cultures. The comforting perfume of butter has permeated my house for the last few days, filling it with wonderful memories of Thanksgivings past spent cooking with my mom. 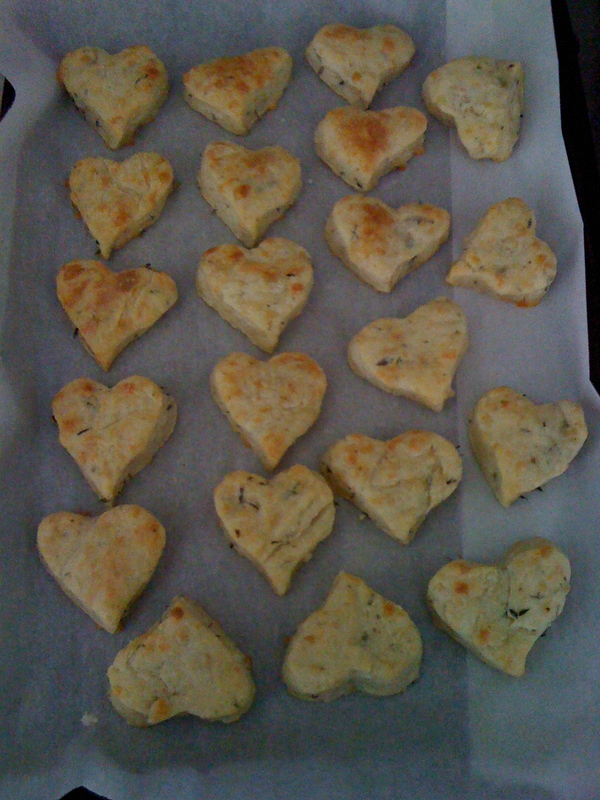 I want to spread some of my thankfulness love her way too because she is the one who taught me to bake and passed her passion on to me. You’d be hard-pressed to find one of our skype conversations that doesn’t include talk of menu planning or recipes. 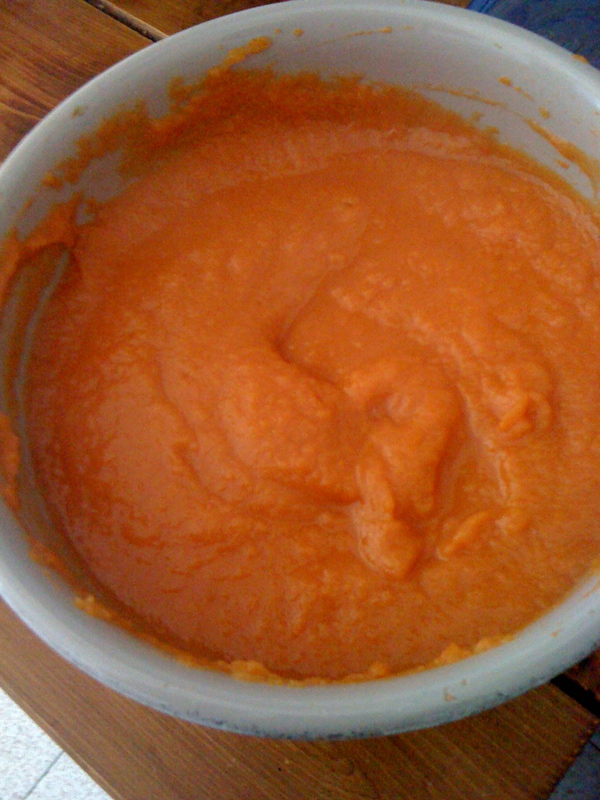 Contributions last year taught me that making homemade pumpkin puree was not only easy, but delicious. 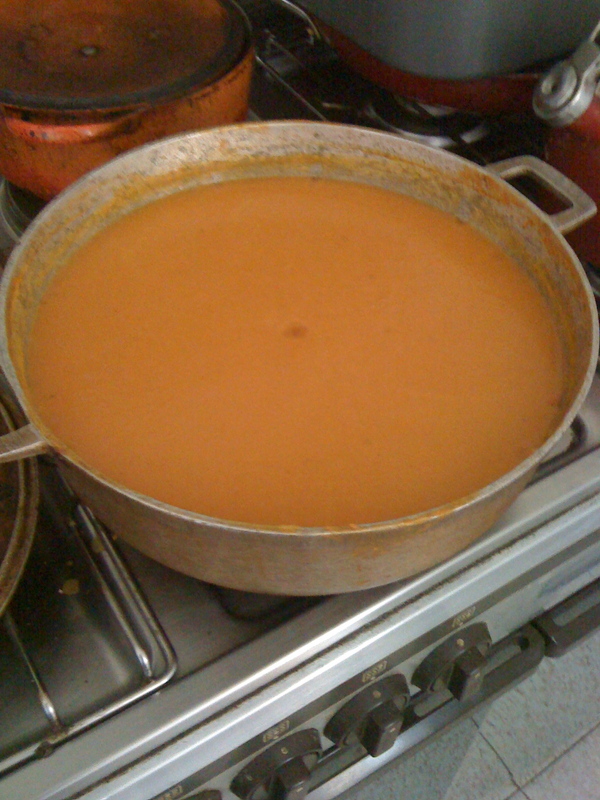 This year I made a pumpkin soup for the starter instead of a dessert. 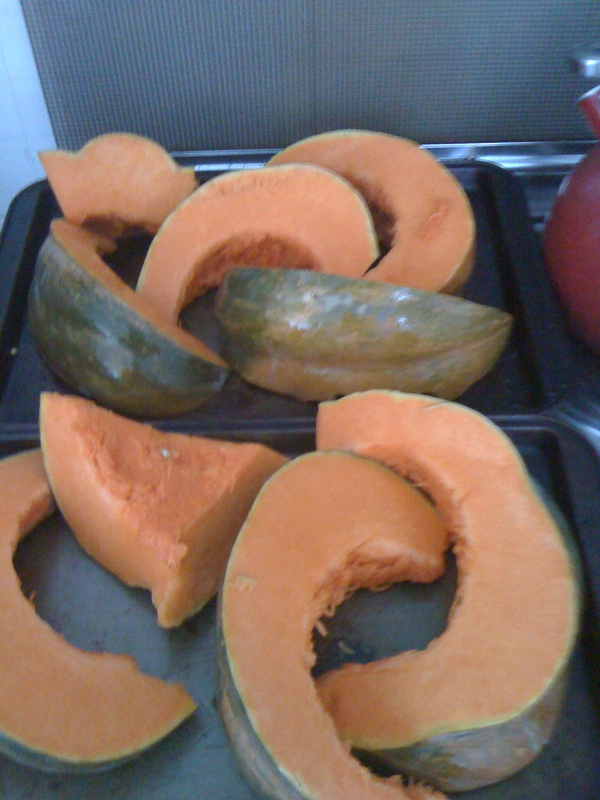 Terry did the pumpkin pie! Preparing for Thanksgiving in Italy always has its challenges and finding corn syrup was one of my toughies. 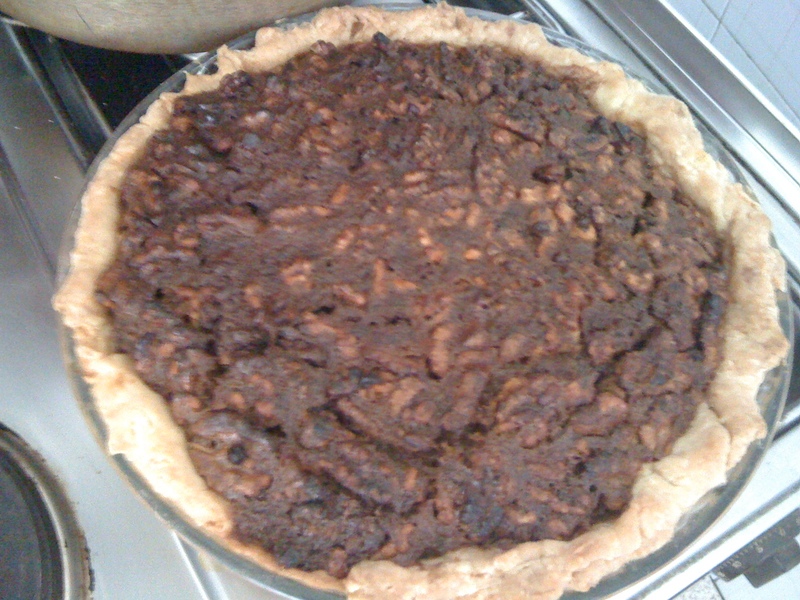 In the end Charles produced a golden syrup from the UK which was a great substitution for my Bourbon Chocolate Walnut pie. He also unearthed some calvados for my soup. 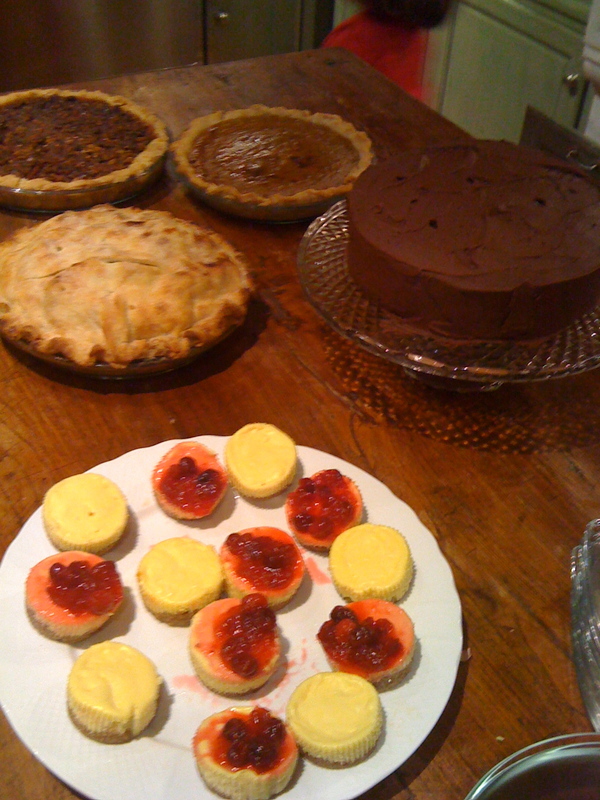 Terry also baked an apple pie and I made some little cheese cakes with a cranberry topping. 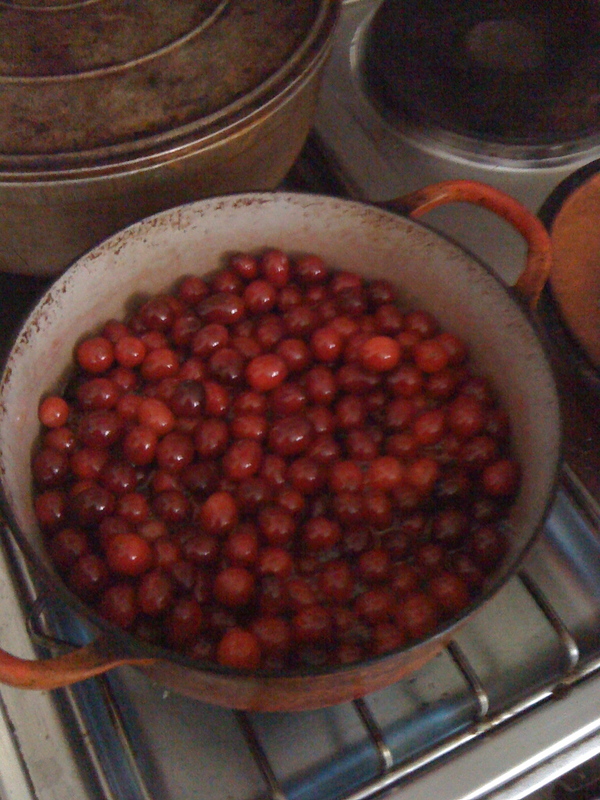 Yes, real cranberries that my friend Janice schlepped from Canada for me!!! 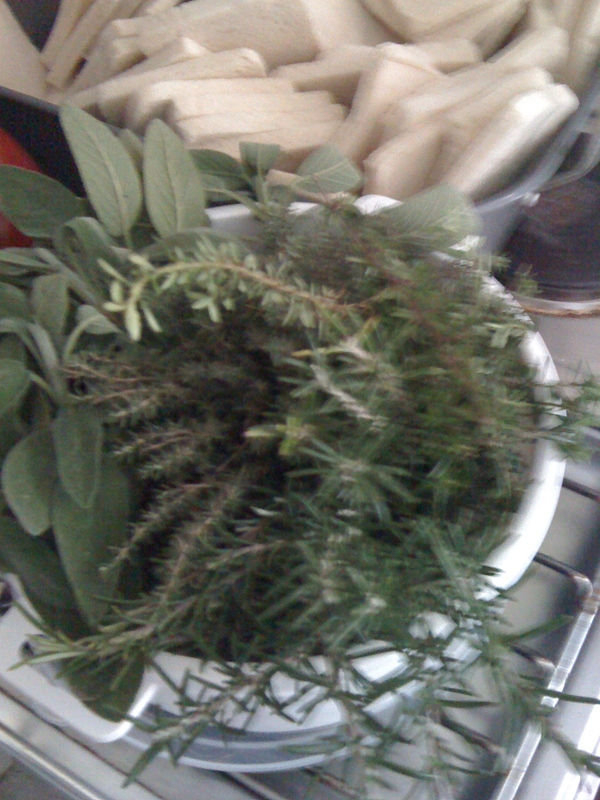 Terry snipped fresh sage and thyme from her garden so I could make my grandmother’s stuffing recipe and my kitchen is beautifully scented with thyme from the herb bouquet on my table! 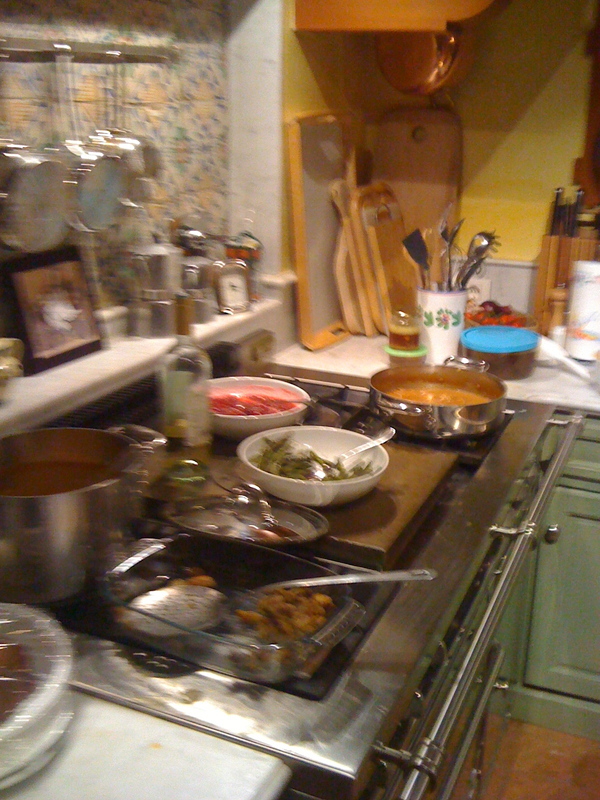 It was a real team effort making the dinner come together. 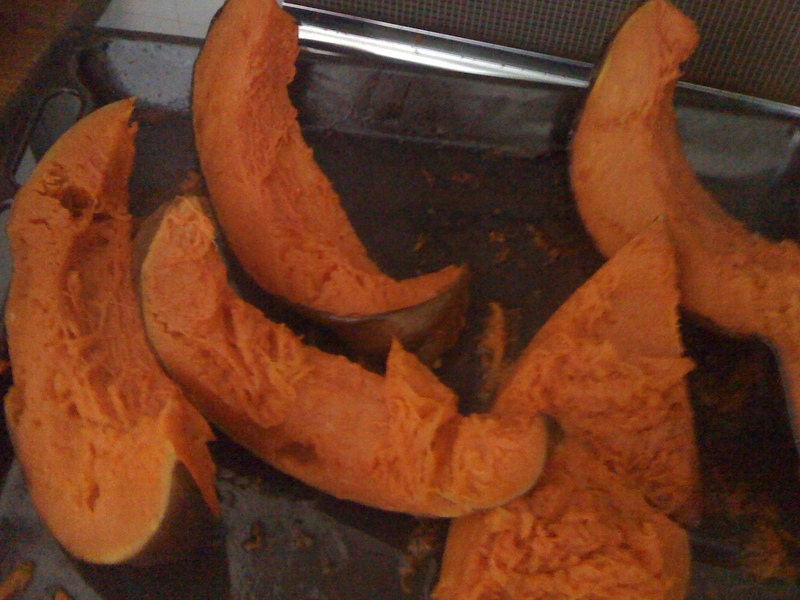 Terry found sweet potatoes in Florence and her friend Alessandro procured two gorgeous turkeys. Yes, two. Terry cooks two turkeys so that everyone can take home leftovers. She is AWESOME. And let’s face it who doesn’t love a good turkey sandwich the day after? The best part after cooking and preparing for two or three days ahead of time is looking forward to a day of munching on leftovers. 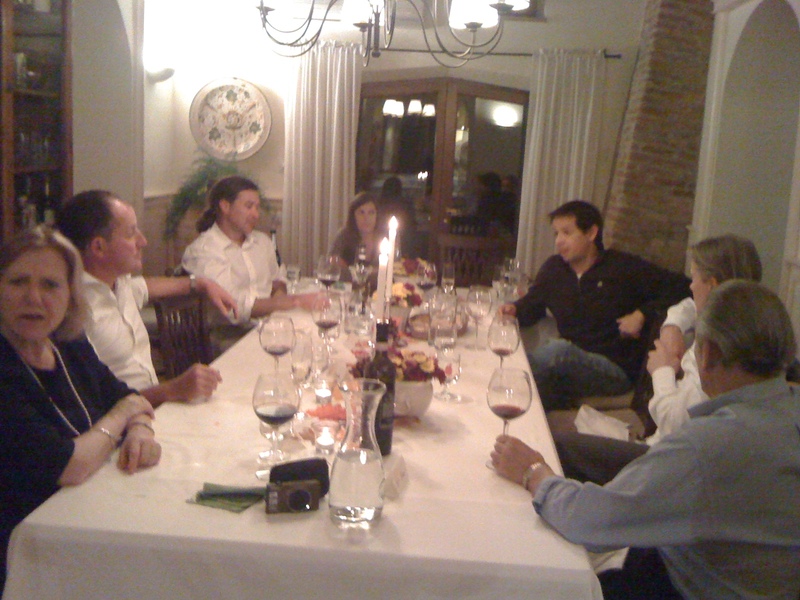 In a true blending of American and Italian style, our dinner went about five hours long with everyone drinking wine at the table and conversation flowing long after the dishes had been cleared. Terry’s husband Vince produced bottle after bottle of wonderful Vino Nobile and Brunello and made sure no one’s glass was ever empty. We had some new expat friends, Ron and Lisa, join us this year. They, (and their adorable son Primo) are spending the year in Montepulciano. Primo actually dressed for dinner, insisting on wearing a bow tie. If this is Italy’s influence, I am loving it! Lisa is a great cook and her zucchini sformato that she whipped up as an appetizer was delicious. Charles and Peter, although being Brits, were a fun addition to our party and they seemed quite impressed with what kind of meal the “colonies” were able to produce! The evening was filled with feasting, love and laughter and as I drifted off to sleep last night I remembered to say thanks for my friends, family and of course, TURKEY! 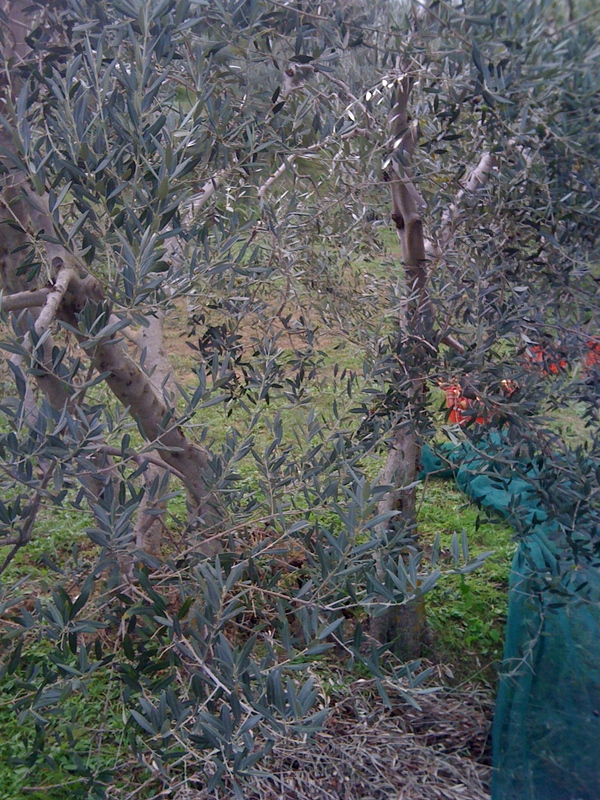 The trees are laden this year… four trees yielded over 100 kios of olives! I got ridiculously excited about fresh cranberries!!! 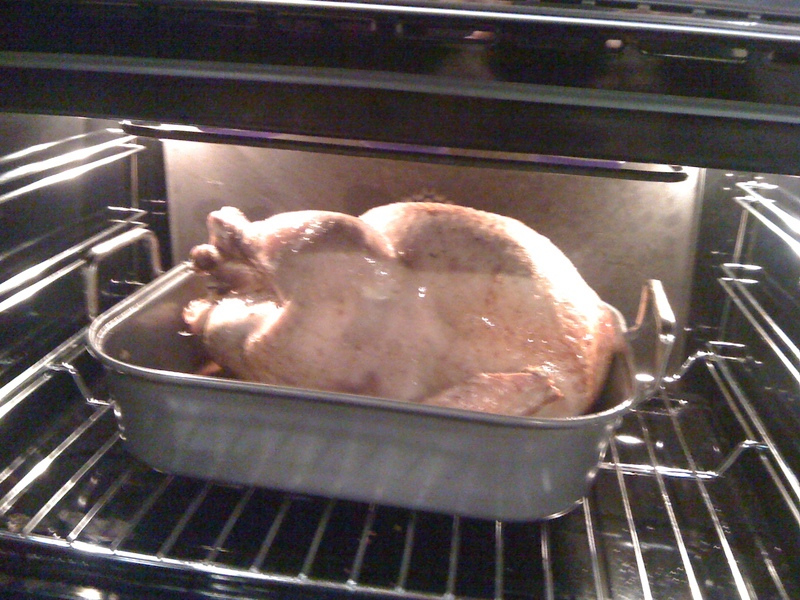 Turkey number 2 a/k/a leftovers baby! 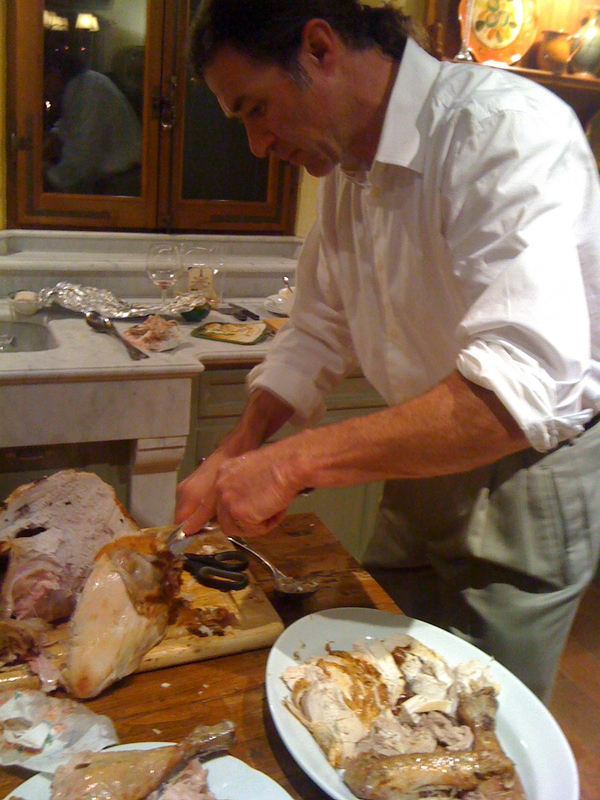 Ron does a an expert job carving the turkey! Italian friends should avert their eyes from the laden plates, but this is how we roll in the US!! My amazing friend Terry also prepared a birthday cake for Charles! I love Janet’s expression when I announce the desserts are ready in the kitchen!! Not sure we have enough… don’t forget the vanilla gelato! Hi Jenny, Wonderful; to read this blog. 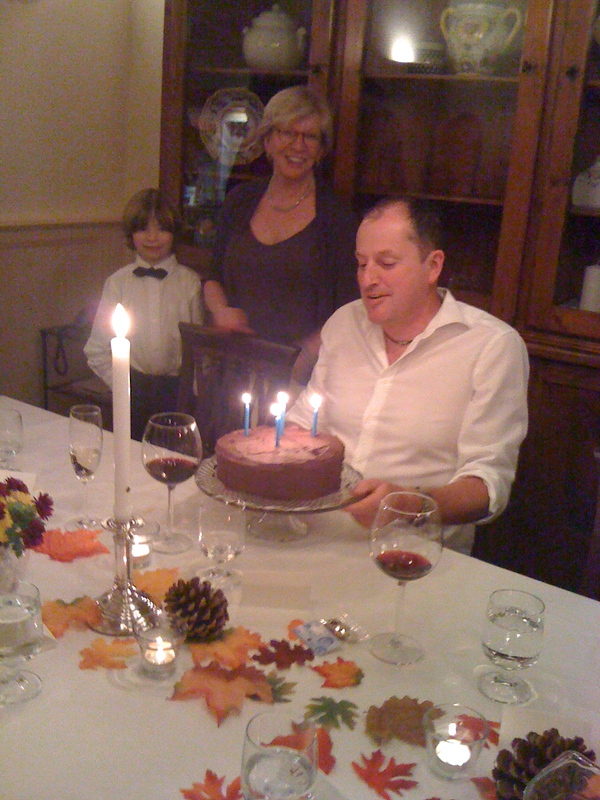 We missed the Olive harvest because we were dog sitting in Switzerland for Rod’s niece who went to a birthday party in the Big Apple. Your old home town!! You would have enjoyed the company of our charge Kita who is half German Shepherd and half Japanese Akita. We had a great time but would really have enjoyed picking the olives with Charles and Peter and attending Nona’s cooking lessons. We can’t have it all!! Hope to see you before too long. We will open a bottle of Poliziano this evening and shall toast you, Charles , Peter, Harold & Maud!! What a wonderful Thanksgiving celebration!! 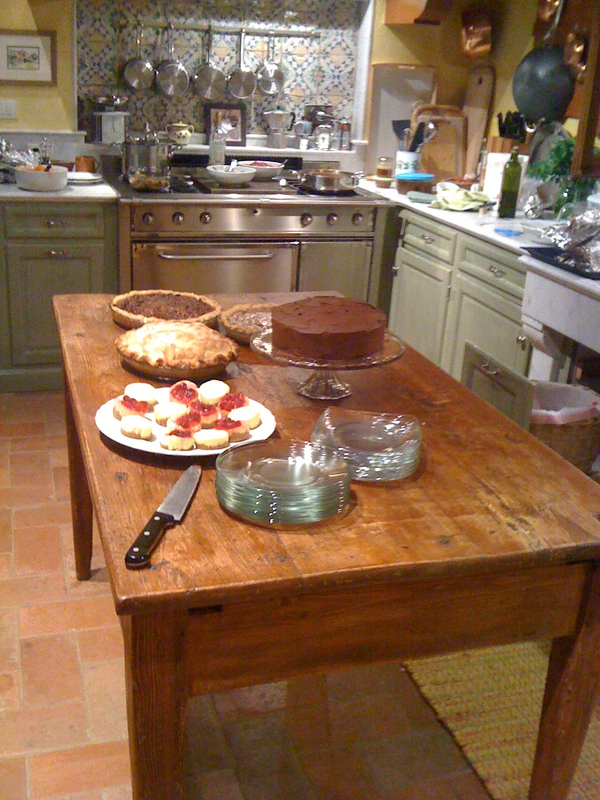 Everything looked homey from the delicious looking and traditional fare to the beautiful table setting. 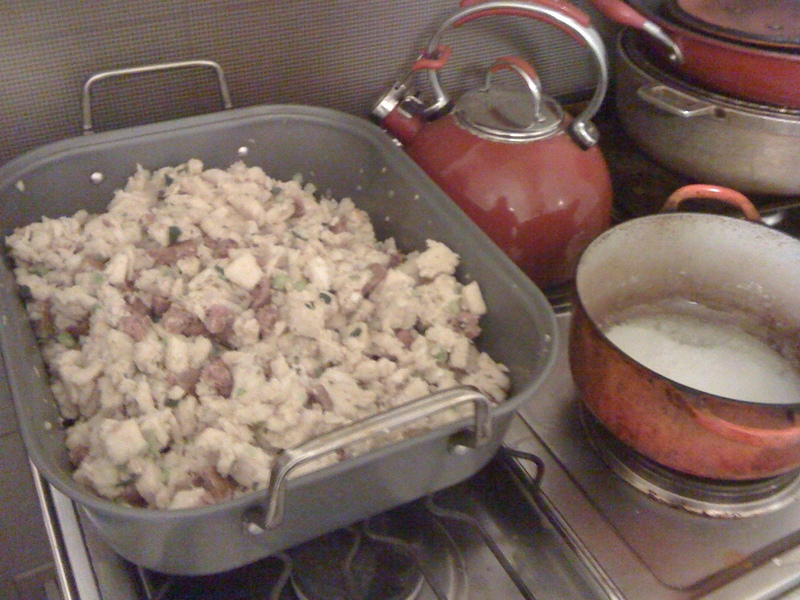 My husband and I are planning a Thankgiving dinner for our expat friends and couple of Italian friends as well. 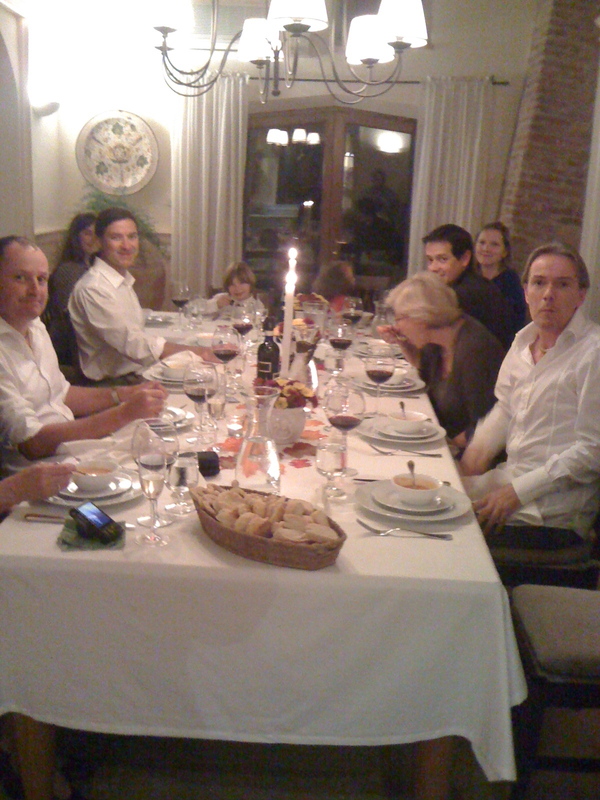 Good food, good vino and good company makes for a memorable holiday and so much to be thankful. I will e-mail you next week Jenn about getting together on November 20 or 21st with Lisa whom you have been in touch with and another ex-pat, Pat from England and me. Beautiful Thanksgiving Feast! I love that you have other Americans to enjoy our holiday. 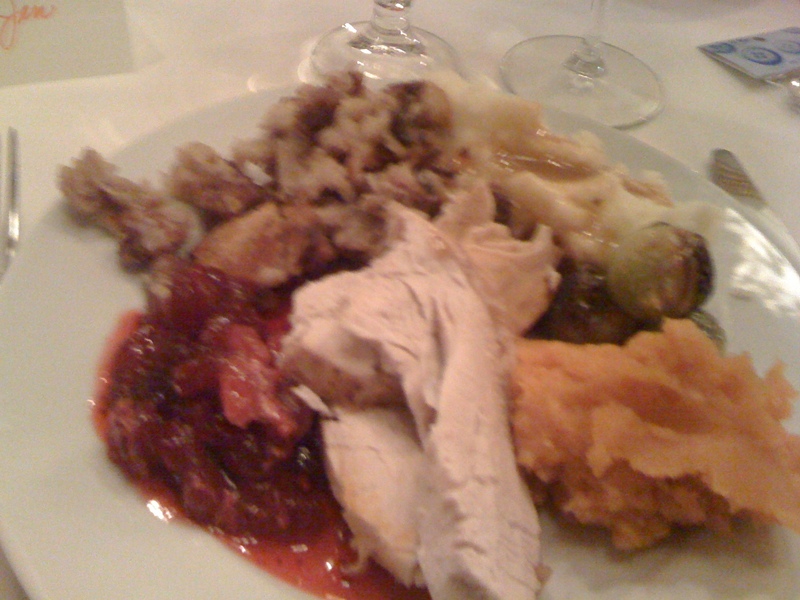 Thanksgiving is my favorite holiday; food, family and friends is what it is all about. I am going to be making Grandma Marcella’s cornbread dressing this year for our feast at Casey’s house. I think I will try to find a bottle of wine from you region so we can toast our Jen.